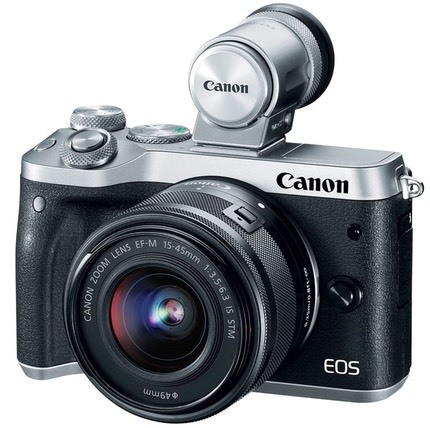 Canon replaced the EOS M3 today with the EOS M6. This new US$780 camera (body only) is basically the same as the EOS M5 in most ways, except it does not feature a built-in EVF. Instead, you use the rear LCD or add the new optional EVF-DC2 electronic viewfinder via the hot shoe. There are a few simplifications from the EOS M5 model—no ISO/WB button/dial combo up top, for instance—but the primary thing you’re giving up by picking the M6 over the M5 is the built-in EVF. This means that you have a pretty clear option of picking the slightly smaller and less expensive EVF-less option, or the slightly larger and more expensive mini-DSLR style. The optional EVF-DC2 is similar to the older one Canon had for earlier EOS M models, but does not tilt. This new EVF is US$250 and works on the EOS M3, EOS M6, PowerShot G1 X Mark II, and PowerShot G3 X.